Off we go, into the post-classical period! Over the next month, we’ll be talking about the rise of Islam and the caliphates, the development of sub-Saharan kingdoms and empires, aristocratic culture in Heian Japan, the persistence of Rome in the Byzantine empire, the birth of Russia, the growth of American empires like the Aztec and Inca, the conquest of– wait for it!— the Mongols over much of Eurasia, feudalism in Western Europe, and the spread of the Black Death. Also, don’t forget that you need to register for your AP exams by February 4th; please use the North Cobb TotalRegistration portal in order to sign up online! Apologies for the late posting on this one, guys. I wasn’t feeling too well yesterday and today, and only just realized I hadn’t put up instructions for the homework assignment for those of you who were absent. I know that there were several of you out on Friday– some for the AP Euro trip to the High, and some for other reasons. You missed a lesson on how to write the Comparative Essay, which is a fairly important topic in this class. The first thing you’ll need to do is check the drop-down menu at the top of this page labeled “Essay Writing Materials”– go to the Comparative Essay tab, and read over the materials linked on that page. You’ll also want to watch the two videos on the page to help you better understand the process of writing the essay, and how the rubric for the essay works. Your homework this weekend is to read over the annotated rubric from the 2009 Comparative Essay, and use that as a standard of grading for ONE of the three sample student essays. On Tuesday we’ll discuss how accurately you graded the essays and address any questions you have regarding AP scoring techniques. Other than that, your homework is to make a stab at your Unit Two Reading– the reading guide and vocabulary assignment can be found on the Unit Two Resources page. If you missed the Unit One Test, remember that you must schedule a time to make it up with me as soon as possible, and that you are only eligible to make up missing work if your absence is excused. I hope you all have a thoughtful and restful Martin Luther King Day, and I’ll see you on Tuesday. Describe the events in Germany beginning in 1933 which led to the Final Solution. What was their purpose? How did these actions normalize discrimination? What were the conditions like in Buchenwald when Murrow and the American troops arrive? What sort of men did Murrow encounter in the camp? What do you think shocked Murrow the most about the experience? What shocked you the most about his description? Murrow, as a journalist, believed that it was his job to make an argument– NOT to be a mere reporter of facts. What argument is he trying to make through this report? What does he want his listeners to feel, learn, and believe as a result of his work? Do you think that he achieved his goal? Why or why not? Remember, normal commenting rules apply: one thoughtful comment which addresses all of the discussion points thoroughly will receive up to 95%, while you must comment and leave a response on someone else’s comment in order to earn full credit. Try to get some rest this weekend, guys– we’ve got the final push coming up over the next two weeks. Remember you have your Unit Six test on Thursday (12/10), and your Student Learning Objective exam on Friday (12/11), so let’s get ready to power through. Thanks so much for your thoughtful participation in our discussion on terror, extremism, and the events in Beirut and Paris today, guys– I know that it took us a bit off-book, but I do think that it’s important to give you guys a space for discussion and analysis when we have events like this. If you’re interested, I’ll link to the full articles we read today at the bottom of this entry. And if you’d like to add your own resources, feel free to drop relevant links in the comments for this entry. I certainly don’t mind if you continue our discussion from today in the comments on this blog– just remember to keep it civil, keep it rational, and post thoughtfully. Now. On to the meat of the issue: since we went off-book today, I need to ask you to cover some content so that we’ll still be on pace for the unit. I’ll be doing some reconfiguring of my lesson plans tonight, too, so if you’ll do this for me, I’ll do the heavy lifting tomorrow and Wednesday. Tonight, please download the following chart (Imperialism in East Asia Cause and Effect Chart), and then use the Imperialism, Opium, and China PowerPoint and your textbook to complete the chart. We’ll discuss it tomorrow at the start of class, before jumping into a discussion of nationalism (which actually connect rather well to some of the things you read about today, honestly). Also, remember that your Content Paper is due December 1st, so keep that in the back of your minds. If you have other materials you would like to add to this list, please feel free to link to them in the comments below. Latin American Revolutions Homework and Due Dates! All right, guys– I know it’s been nothin’ but revolutions this week, but you’ve got one more. Or rather, a series of revolutions. What you need to do is get out your Latin American Revolution handout from class (or download another copy here: The Age of Revolutions in Latin America), and complete it using the Crash Course video located below, your textbooks, and the notes from this PowerPoint: Latin American Revolutions. Additionally, remember that we’ll be in the Media Center tomorrow for a WebQuest, and I’ll be absent on Tuesday of next week for Model UN. (You’ll have a lot of work in my absence, so try not to get too excited.) Also, I’ll be teaching you how to write the third and final type of essay for this course on the 20th, so if you know you’re going to be absent that day in advance of Thanksgiving break, please let me know so that we can make arrangements. Unit Three Pacing and Due Dates! First things first: you have no assigned homework this weekend, but that doesn’t mean that you don’t have stuff to do– check your unit three reading assignment. Yeah. It’s a lot. You’d better get started on it NOW. It’s going to rain all weekend anyway. Stay in, watch football (root for the Dawgs, obviously), and get some reading done. And while it’s not a due date for our class, please know that the PSAT will be administered on Wednesday, October 14th. As sophomores, you’ll all be taking the test. We’ll be in an altered schedule, so I won’t see any class other than third period that day. Film Review: Extra Essay Assignment! Are your essay grades less than desirable? Do you need to do some grade repair? Then you need to complete the Real to Reel: AP World History on Film assignment by Friday, October 2nd! As we discussed in class, remember that this assignment is NOT a simple bonus assignment– your work needs to be thoughtful, reasoned, and polished, and address all of the requirements described in the assignment sheet above. Poor quality work will be graded as such. This is, however, an optional assignment– you are not required to complete this review, and if you choose not to submit one, you will simply be given an exemption. The Lion in Winter, dir. Anthony Harvey (1968)— remember, this one is rated PG, but the content is definitely edgy. Best to clear this one with your parents first. Some of these you may be able to find online or through instant streaming services, and some you may not. You may even find it useful to check at your local community library for a few of these– they’re well-regarded films, many of which have won Oscars, so it’s not unlikely that you’d be able to check a DVD out from a library if you can’t find the movie streaming on Netflix. Breaking news for first period! Mr. Revard has just announced that, as the largest provider of cans/non-perishables in the main building, we WILL be getting a Chic-fil-A breakfast on Friday morning! Excellent work, guys. Shanah Tovah to those of you celebrating, and to everyone else, happy Monday! You’ve got four more school days to make it through before Fall Break. Hang in there, guys– you can do this. You don’t have any formal homework this evening, but don’t forget that your Unit Three reading should be complete by Friday (when you have a reading quiz), and your Unit Three vocabulary assignment is due at the same time. (If you’ve lost your original handout, please check the Unit Three Materials page and download another copy.) So while you don’t need to do any extra work this evening, you DO need to make sure that you’re keeping up with your reading and vocabulary. If you’ve expressed interest in applying for the Governor’s Honors Program in Social Studies, you will need to turn your COMPLETED application in to me (Ms. Galloway) by 3:40 on Wednesday afternoon (9/16). We will be contacting students regarding their interview times over the next few days. We can only nominate five students as a department, so make sure your application is stellar. Don’t forget: Picture Day is during first period on Wednesday (9/16). Yes, that’s the same day as your in-class essay. It’ll be fine. You’re still going to write. You’ll just look fancy doing it. Remember to make sure that your direct comparisons are clear, and don’t forget to explain WHY and HOW things happen. All right, lovely people! Here we go, off into the medieval period. You should have received a copy of the unit three reading guide and vocabulary assignment today in class– if you’ve misplaced yours, please make sure to download a copy from the Unit Three materials page. This unit is going to feel a little fragmented, since we’ve got Labor Day coming up this Monday and Fall Break (Sept. 21 – 25) during this unit as well. The best advice I can give you is to stay on top of your reading and to make sure that you review your notes during your break so that it’s not a total shock when you get back to class. One more piece of business– remember, those of you interested in applying for the Governor’s Honors Program this summer, there’s an informational meeting in the ID lab in the Freshman Academy at 7:45 AM and 3:30 PM tomorrow, September 3rd. If you can’t make it to the meeting, please check in with Ms. Biddy in room 2106. As to tonight’s homework– you should have received a copy of The Spread of Islam in class today. Please read the article carefully, and then respond in comments to the following discussion points. Remember, the usual commenting policy applies– one good comment which addresses the prompts fully can receive a maximum grade of 95%, while one good comment PLUS a response to a classmate’s comment is eligible for a full 100% of credit on the assignment. Please provide specific examples from the text when possible to support your position. Based on your readings and our discussions in class today, what factors led to the rapid expansion of Islam between the 7th and 15th centuries? What made Islam attractive to people in sub-Saharan Africa? In India? Central Asia? Southeast Asia? How did Islam change as it moved into new regions? Do you think these transformations– and those which took place during the diffusion of Buddhism and Christianity– are beneficial to religions, or harmful? Justify your answer with evidence from your readings. Additionally– and I know that I don’t need to remind you wonderful people– as we are discussing religion, please remember to keep your conversation academic and respectful, and remember that I am moderating all comments. And comments I find inappropriate will be prevented from posting. Have a good evening, and I’ll see you tomorrow! Egypt and the Indus River Valley! 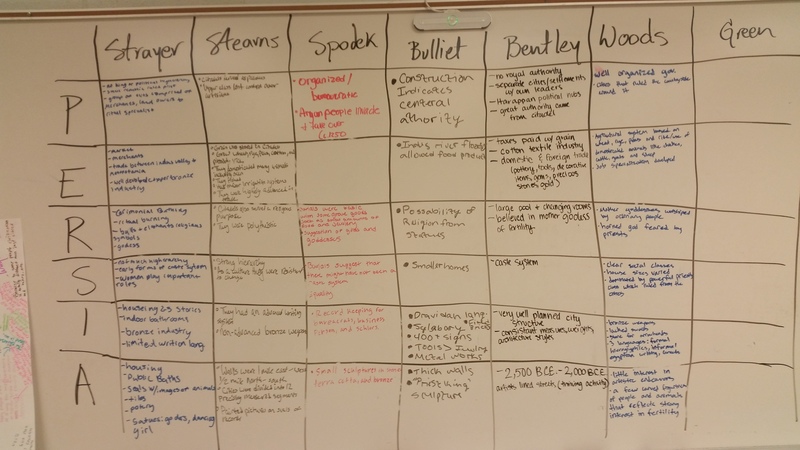 We also began working on identifying the major political, economic, religious, social, intellectual, and artistic accomplishments of the Indus River Valley civilization by comparing what various AP World History textbooks have to say on the subject. We’ll be finishing this up tomorrow, and then moving on to China. Remember, if you were absent for the reading quiz on Friday, you need to schedule a make-up with me as quickly as possible. Everyone else: you have until Monday, August 17th at 4:30 PM to get your quiz corrections completed. I totally forgot to remind first period, but we’ll be taking our reading quiz for Unit One over the first fourteen chapters of Guns, Germs, and Steel tomorrow. Additionally, your summer reading journal is going to be due at the start of class, so don’t forget to bring it with you! Consider the historical example Diamond uses in the chapter “Collision at Cajamarca”– what sort of advantages did the Spanish have? What disadvantages did the Incas have? Why did the conquest occur? Consider the reasons why food production developed in some parts of the world, and why it failed to develop in others. What makes an animal domesticable? Why and how were animals domesticated? Why do some places not have domesticated animals? How did plant domestication occur? Be able to describe the process. Why did Diamond decide to write Guns, Germs, and Steel? What is his point of view (remember, POV is different from argument! ), and how does that point of view influence what he’s writing? Remember that this is only a STARTING point for the quiz, so it’s a good idea to review your whole summer reading journal for this. Happy studying! New semester, new class, new start. I hope you all had a great first day as sophomores. Remember, if you’ve got any problems with your schedule (missing classes, duplicate classes, incorrect classes) to let your teachers know immediately this week so we can get you settled into whatever courses are correct for you as quickly as possible. Tonight, I need you to do a few things for me. First, sit down with your parents or guardians and go over the AP World History Class Handbook which you received today in class. We went over some of it in class, but you should really take a moment to look through the whole thing– and make sure you show it to your parents, as well. (If they’d like their own copy, by the way, they can download a .pdf of the handbook here: APWHHandbook.) Once you’ve read over the handbook, please sign the acknowledgment sheet at the back of the handbook, remove it, and put it in your folder to return to me. After looking over the handbook, please take a few minutes and complete the student information survey embedded below. Please provide the most accurate information you can so that I can have a better picture of who you are and how I can best help you be successful in the course. You will need your handbook with you as you fill out the survey, as there are several questions which ask you to review information from the class handbook and website. Remember, any handouts or readings from class for Unit One will be located on the Unit One Materials page of this website. That includes copies of the handbook, unit one vocabulary assignments, and the unit one study guide. If you didn’t get a chance today in class, remember to register for the APWH Fall Semester Remind announcement list by texting @apwhkhan to 81010. This will allow you to receive notifications about class assignments and other events.